A large format UV Exposure Unit with a small footprint. This exposure unit allows the printing of large panels up to 1100 mm long by up to 800 mm wide. Both sides of the panel are exposed to UV light one side at a time. By keeping the photo tools in intimate contact with the panel during the 'flip-over' vacuum miss-registration is eliminated. 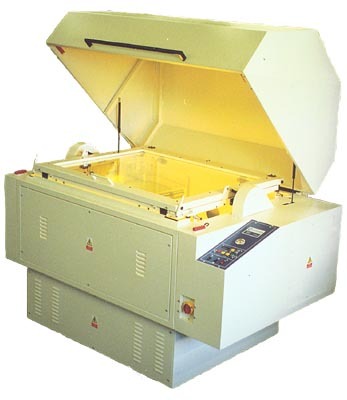 The basic machine is 3kw, manually operated and has a polyester and glass vacuum frame. A feature of the unit is the evenness of the light spread which is better than 4% over the whole frame and from side to side. To improve productivity the frame rotation can be motorised (as above). This means that once loaded and initiated there is no operator intervention until both sides have been exposed. To improve registration and repeatability a Glass-to-Glass vacuum frame can be added in place of the standard Glass- Polyester frame. This vacuum frame is a very versatile frame and is designed to be hard wearing and allows panels from O.2mm up to 3 .4mm with no seal change. A very simple modification can be made to allow panels up to 6.4 mm thick to be exposed.